Learning SEO is important for every webmaster and blogger. Why? Because no matter how great the content on your site is, you're not getting any of it into search results if you don't apply SEO tactics. SEO makes your content visible to the outside world. Therefore, for your content to actually bring in any traffic, you need SEO. We have previously shared various posts on search engine optimization, but today, I'd like to share some SEO settings that every blogger should apply on their blog. These are specific to Blogger, but that doesn't mean you can't apply some of them to other platforms. Choosing the post topic is the most important part of creating content. The topic you choose should be compliant with what your users want. It should be unique and original, and should offer something of value to the users. Then, as you're constructing your post, you should ask yourself some questions regarding the topic and content (see Number 20 below). Always check to see what your competitors are doing; what topics they're posting about, what strategies they're using, and most importantly, what's hot on their websites. I'm not saying that you go ahead and copy them. But take a general hint before coming up with your own content ideas. Make sure you follow the latest trends and news on various social media networks. Write about what's hot. Writing on the most recent trends not only brings in a lot of readers, it also tells search engines that your website is dynamic, and provides fresh and latest content to its users. 4. Keyword research before post! So, you've decided to write about something. But you're looking for words to explain? You have to learn how to do some keyword research first. You will need keywords for various different things, such as titles, meta descriptions, tags, and so on. Check out this article on doing keyword research to find out more about it. A good blogger might be a good writer, but the vice-versa isn't always true. A good writer might know how to write for readers, but a blogger also knows how to write for search engines. To be a good blogger, you need to adopt a technical style of writing, keep a consistent approach, and a lot more. Check out this post on creating great content that applies to readers as well as search engines. There's no such thing as an 'ideal word limit' for a blog post. It purely depends on the number of posts you publish, and the post topic. But SEO experts agree on a minimum of 300 words to avoid penalties. We would recommend a range of 500-700 words on average, since that seems to be the magic number when it comes to readers - neither too short so as to miss out on important things, nor too long for it to get boring. 7. The title is the king! The title is the most important part of a blog post, since it is the one that actually brings in the clicks. Optimizing post titles is a part of being a good blogger. Check out this post to learn all about creating search engine friendly post titles. Always keep permalinks short. Use custom permalinks of around 4-5 words at max, and separate each word a hyphen "-". Make sure you capture your most important keyword in the permalink (your focus keyword). Keep all the keywords you can up with at the start in mind, and use them all in your introductory paragraph. It doesn't matter how many keywords you use in the content. But you must use them all at least once in the intro paragraph. Always use a combination of different headings. Usually, blog titles are H1s, so never use H1s. Post titles are usually H2s, so don't use H2s either. Use them only rarely. For the most part, use a combination of H3s and H4s in your post to specify a clear hierarchy in your content. Typography refers to the styling of your content. It is almost as important as the content itself. Try to use different colored headings; use italic and bold text to emphasise your keywords, Also, once you're done writing your content, select all by pressing Ctrl + A, and then justify its alignment, so that the text looks neat at both ends. The Meta description is the second-most important part of your post (after post title), as it is what users will see on a search engine (along with your title). Write a very short description of at most 170-180 characters, and make sure to include all the important keywords in it which you came up with before writing the actual post. Every post on your blog must have an internal link to another relevant post. This is one of the many ways to improve our rank. Try to at create at least two internal links within your intro paragraph, and at least one or two more in the rest of content. For a detailed guide, read the following post. An anchor text is the text you use to link to another page, and it is what users click to get to that other page. Choosing anchor text is a very important part of linking. Never use a single word anchor text. Always use a phrase. Usually, a three-word phrase is the best option. Always use a keyword phrase as anchor text. Also, keep in mind to never use the same anchor text twice for the same link. It is considered as keyword stuffing, and/or spamming. Whether on your site or another, always vary the anchor text. A nofollow attribute in a link tells a search crawler not to 'follow' a link. First of all, when linking to external pages, always link to a page that has a better rank than yours. But if you must link to a lower quality page, always us the rel="nofollow" attribute with the link tag. But never do this for reputable sites, like Google, Wikipedia etc, nor for linking to your own pages. When to add a nofollow tag? Images, videos, infographics, animations; such things spice up your content. If you have a video related to your content, that's great. Otherwise, try to include at least one image in you blog post. And depending upon the topic, you can add many. But make sure you don't add too many, so much so that the textual content gets snuffed out. Before uploading a video, audio, or image file, always make sure you rename it. Use meaningful keywords, and separate them with dashes. This way, users and search engines can tell what the file is about just by its file path! Suppose you want to display an image that is 500 pixels wide and 300 pixels high. There's no point in uploading a 1200x720 image. It'll take up space on your server, and rendering time at the user's end. Do everybody a favour, and scale down your images before uploading them. Always tag images with Titles and Alt text. And always use relevant keywords. We've compiled some posts for you regarding image optimization. Make sure you check them out! So you've created really awesome content. Great! But before it is internet-worthy, you need to ask yourself a few questions about. If the answer to any of the questions below is no, then there's something wrong with the content! Organize your blog's structure into a series of Labels (or tags and categories if you're using WordPress). Use at least one, and at max three labels for one blog post. And keep the total number of labels between 15 and 20 (for Blogger blogs, but same for categories in WordPress). posts as you complete them. Always schedule them for an appropriate time. For example, monitor your traffic stats and see what time do you get the most amount of traffic. You might want to schedule your posts for around that time. But try to be consistent about your timing. Pick a timing that works for you, and stick to it! A sitemap is a listing of all the pages on your site. Often times, search crawlers might miss out on a page because you might not have linked to it in any other page. So to tell search engines to index that isolated page, you have to submit a sitemap to them. You could use a plugin for generating a sitemap, or read our post on Blogger Sitemap Generator for more details. Sitelinks appear on blogs that have PR 2 or above, and they are a collection of some of the links on your blog that appear in Google search results. They make your blog look more professional. Check out our post on how to tell Google what links to display in sitelinks. Add social bookmarking widgets on your blog to improve your social rankings. Search engines like it when they find links to your social profiles. Besides, such widgets make it easier for users to share your content. Submitting your blog to directories such as DMoz increases the number of backlinks you have, and in turn, your website's rank. Why submit blog posts to the top 10 article directories? Submit your blog to bloggers directories now! PageRank is Google's way of ranking websites. The higher your PR, the better chances you have of getting into search results, and the faster your index rate will be. Read the following post to learn a lot more about PageRank, and how to improve it. In the end, avoid using shady SEO tactics to jump your rank. Always use Search engine friendly techniques to avoid algorithmic penalties. Check out the following posts for more info. Totally agree with your recommended word limit. You didn't post about how many images should use in one blog post? I think use many image is good but you must add alt tag and tittle tag . Its always good to limit the number of images per post as it affects the page load speed. very nice post. thank you for sharing such a post. seo is very important for the blog. During blog posting we have to keep many things in mind the content should be original, the title should be impressive, the content should be relevant, the linking between the pages should be proper, if there is an error page it should be shown to the visitor and properly formatted, there should be atleast one link in your blog, the backlinks to your site should be given on a relevant site and the keywords you decide should be there in your blog these all techniques increase traffic on your which increase the ranking of your site. Very nice! a brief post and complete information. Excellent work! Reading this can make me afraid to write anything in my blog! Oh my! I think there should be a beginner kit for SEO. Or else this will only deter newbie to own a blog with all sort of recommendation. SEO is most important factor for any blog. Absolutely I agreed with you my friends . Paramount information really great to know all that information. In point No9 you mentioned "it doesn't matter how many keywords you use in your post"; please redraft it because it gives an impression that there is not restriction of keyword stuffing. thankyou for your input! We'll take care of that! Fantastic and informative post. I'll be bookmarking this page to refer to on a regular basis. Quite informative post. Worth reading and implementing this !! I could not imagine how useful those things you have mentioned above. This is Bravo! You have shared valuable information about SEO tips for blogs but in my views content is king , if we post blogs related to current development in respective fields and promote it on social media . This would help our blog to rank well on google. This is really a awesome post.. you included a maximum topics regarding seo and thanks remember a post like this to new bloggers. Thanks to MBT. You do not use h1 in the post, that's too bad. This is really helpful article. iwrahost.com is best and cheapest web hosting company for 2013. iwrahost.com support is very excellent and dedicated in web hosting . This site is very interesting article about blogging. iwrahost.com is the reliable hosting in my experience. It is the best and cheapest web hosting company. packages with a garantee of a definite increase in traffic or you get you money back. How cool is that! Can't beat our work and rate! Please contact and I would be more than happy to help you. let me see is working on these tips will do something regarding the website and blog. Good post bro, but if this post was written by mustafa bro then it would be awesome. Your tips are very useful for those first timer in doing blog or blogsites like me. I need to follow your tip in terms of SEO and etc. Because to be honest I don't have any knowledge about Information Technology, as well as on how to enhance/develop more my blogsite. I'll do some research about your tips on SEO and other things that might help my blogsite to generate more prospective clients/customer. I really need a help to someone who has more experience in this matter. Because I have international friend, we don't know each other as person, he's an Indian who try and help me on how to figure out my blogsite. But now his far away from his city, so no way of communicating him. I'm a entrepreneur, so I need to explore different things to do more out of my comfort zone, and improving my business-site is another thing that I should do to improve my business. this just another perfect post about Search Engine optimization for all bloggers out there thanks Qasim for sharing such nice information with us. Very nice Post... Great work Admin..
How do you want to make your party so special? Hire the services but keep in mind the idea should be completely yours. Come and join a Party with us, and see what we can do!!!!!!!!!!!! thank you for publishing such an important and useful information..I really appreciate your work. .i'll implement this to my blog. my blog is WWW.UnixBabuForum.in ..it is informative to all unix users. Your post was awesome I really like your Post very much.It seems to be a very good energy source.I'll often visit your post for upcoming updates. Good to know your topics.i have tried these things. I am pretty agree on that point to use the 500 to 700 for a post. I think using the exact words regarding a topic is a better way to engage readers. Nowadays people do not read more content they just read the heading or pretty more. I am personally running a Tech blog at which i usually use 300 plus to 500 words which are good for traffic and SERPS. Thanks for sharing this information with us. I am a big fan of reading, thanks for sharing this wonderful information. This is so helpful. Thanks for sharing. I hadn't heard of some of these tips. I definitely see where I can improve. Thanks!! learn how seo works and convert what learning to earnings! You can learn seo easily from the professionals. These are best and important tips for every blogger. I'm already using these all. Thanks a lot for this nice information..
All About Blogger at one Place Nice. Nice and helpful topic. I like it. Thanks a lot for sharing. 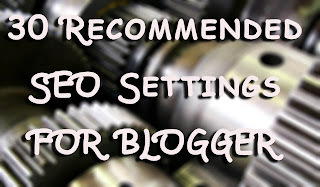 These SEO settings by the blogger are highly informational and explanatory ones. Keyword planner will help to find the competition. PA rank plays main role after keywords . Wow amazing tips. I just say one thing use Live chat services on your website. because marketing increase your traffic and when somebody visit your website live chat team answers all visitors questions and satisfy them. Its a very nice post to read. It is also very helpful for me. Thanks a lot for sharing. Genius! Thanks for sharing this, I had a little trouble with the code for swapping the post titles, but I figured it out. A very informative article! This certainly got me thinking about issues for my blog. They were some of the basics of SEO for the bloggers and I find them useful to re-collect all the memories. Thanks for sharing this blog.I like this blog very much. really such an nice and decent information shared here with awesome staff.More info please visit :-Top SEO Companies 2013. This web site is one thing that’s needed on the internet, someone with a bit of originality!....... by ETH 125 Week 1 provider. Nice tips bro, keep it up. http://kapamilyascoop.blogspot.com it is only it's third day today.. but, following your instructions made it not a 3day typical blog :) i had it google indexed and some of my articles ranked! just 3days..
Really great article. I agree with you. You specify many topics under one roof. Its really very helpful to me. Fantastic post that really useful. It is very descriptive and covered by most of topics. Awesome list of Blogger tips ! Even after years of blogging and SEO, these points are still valid today. A perfect detailed guideline for anyone using Blogger. Thanks!! Great article and nice tips. This is what I was searching for. Really nice blog on SEO tips and tricks. Thanks for sharing with us. I Do Everything To Perfect My Site Seo Structure . But My Site http://animotime.com/ Never Get High Ranking On Google. Can Anyone Tell Me Why i'm Not getting Good Seo Rank. And one Day i Share My Post On Facebook. Suddenly My Site Appear On Google First Page . Why This Is happen. Hi, Thanks for your post, I am new in seo and it is really helpful for me. But i have a question. Can you pls explain about guest posting, actually I have read many blogs but not able to understand what exactly is this. really thanks a lot.. but plz tell me one thing that how many character i choose for my post title. or tell me the word limit of my post title not page title. Thank you brother for your nice share. Long time I have been you fan. I really helped by your informative information. Al those make me a little blogger. I am trying to success in the way by following your instructions. Hope I will be a pro blogger as like you. Info Technology & Tips is my First Blog. I start it after reading you article. Still working on it. These are great advices, I hope they will work with my blog as well. Thanks a lot! love your content .you have mentioned very good seo tips and tricsk here. Just Bookmarked your blog . Second I have a question... I have a confusion about co-citation . Can You clearify that? Your post was awesome I really like your Post very much.It seems to be a very good source about SEO Settings .I'll often visit your post for upcoming updates. Useful Text, Well explained about SEO Scope in Internet Marketing.